JUST KIDDING! Please do not go out and eat a ton of food simply because you are bored and blame me on the aftermath…But in all seriousness…this past weekend, good food (and company :)) turned a somewhat mundane getaway into a fun weekend! Like Steph, I too got to play tourist for a day. But instead of playing tourist here in our home town of D.C., Chris and I planned a little getaway on the Eastern Shore of Maryland, in St. Michaels. We had big expectations. In our minds we were both expecting a small but exciting town with a plethora of shops and cafes/restaurants, beaches to dig our feet into, an ocean front hotel room with a balcony, etc etc. Long story short…in our heads it was the perfect weekend getaway. In reality, the food was the highlight. 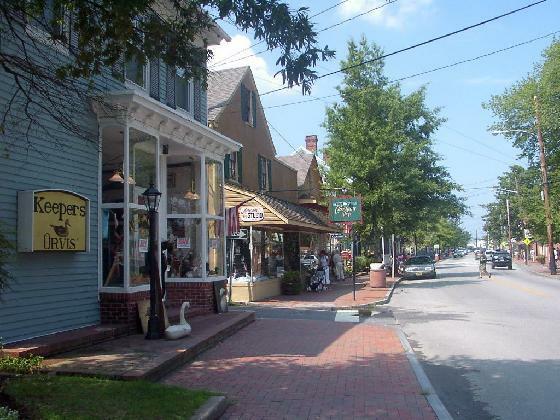 Don’t get me wrong, St. Michaels is a nice little quaint town. Quaint being the key word. To go along with this and this…I/we don’t do quaint, quiet, relaxed, low key, etc. You will not be surprised that we decided to stick around D.C. until after our Saturday morning swim practice to leave. It is the hardest practice of the week and we both look forward to getting our behinds kicked every week. 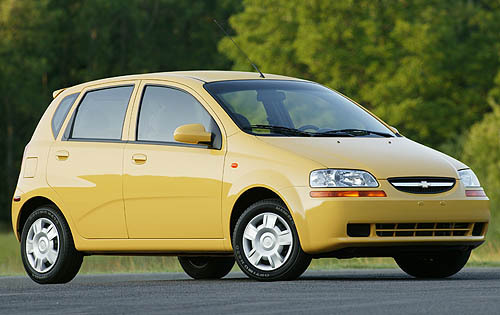 So after swimming, we jumped in our speedy yellow rented Chevy Aveo and were on our way to the big exciting town of St. Michaels. 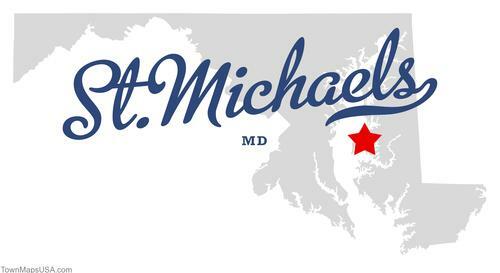 We drove over the bay bridge, past Annapolis and then south into St. Michaels. When we got there, we were more than ready for lunch, but decided to check into our ocean front balcony included hotel room first. “Suite” # 109 did not face the ocean 😦 Suite # 109 was in the back of our ocean front hotel with a really nice view of a fence…and some shrubs. 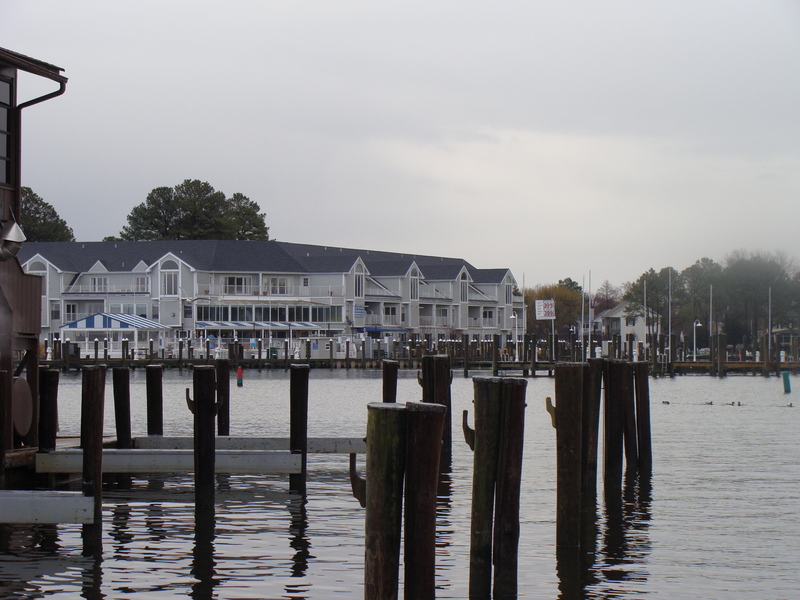 This is a view of our hotel from across the harbor. You can’t see our room. It is in the back…by the fence. 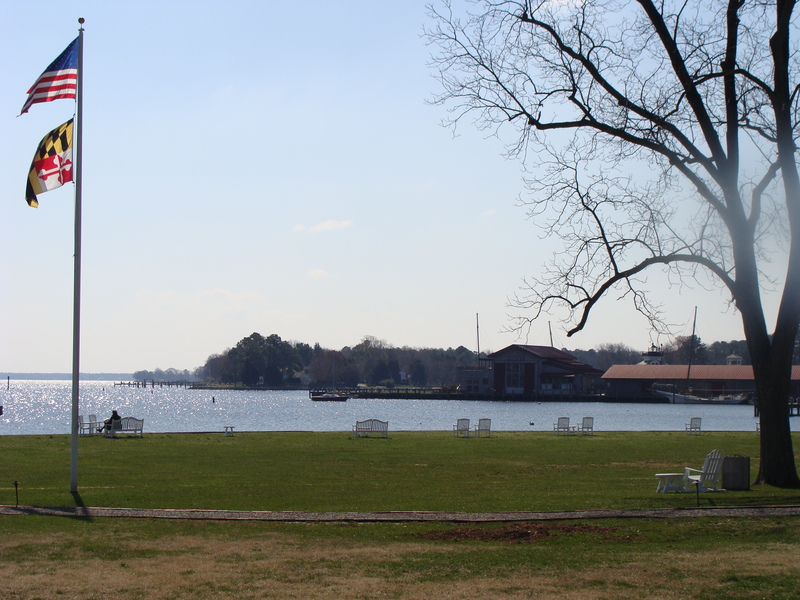 No complaints though…we were on vacation and simply being by the water was a pleasure! We decided to leave our speedy little yellow Aveo behind and walk into town. I had (of course) checked out the restaurant situation ahead of time and picked out a lunch, dinner and brunch spot for the next day. 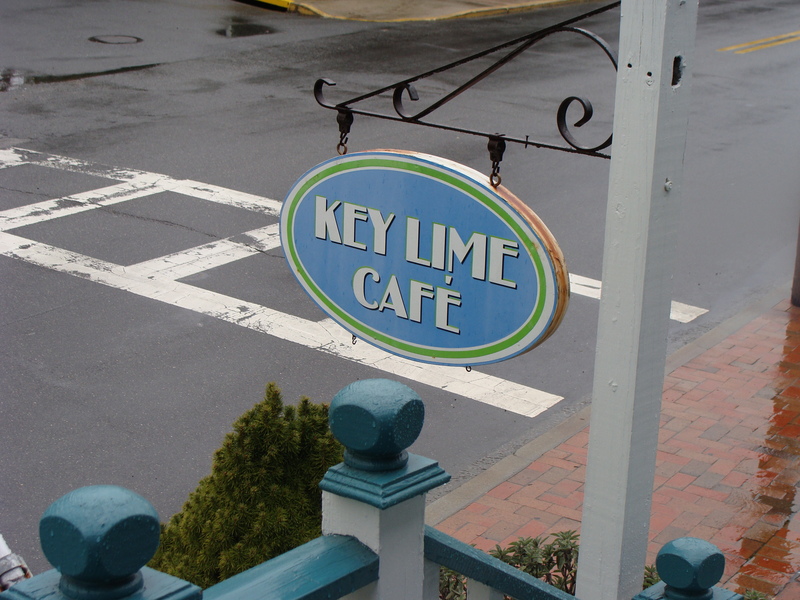 We found ourselves I led us to the Key Lime Cafe. Do not go/come to Maryland and not eat crab. 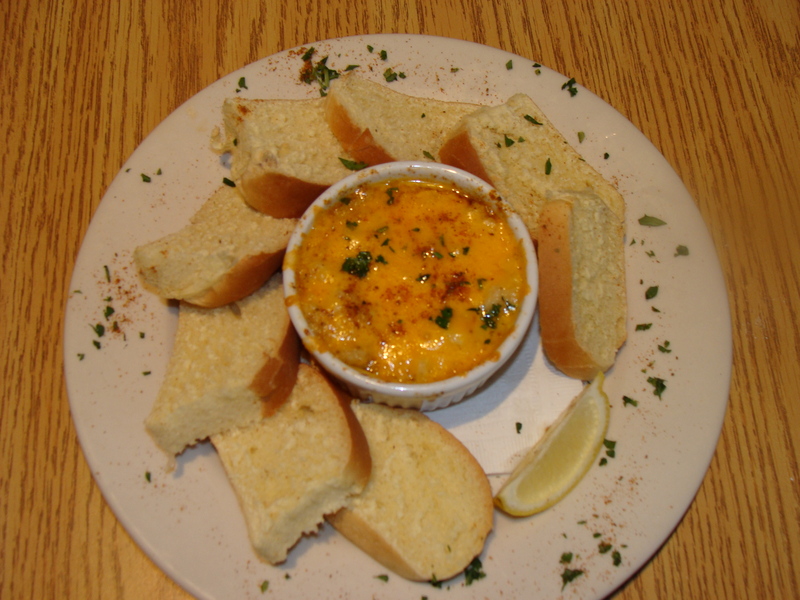 This crab dip was extremely gooey, packed with big chunks of real crab and topped with melted cheddar cheese and Old Bay. Do not go/come to Maryland and not eat Old Bay. The bread tasted like Challah and was super moist and a little sweet. so good. After a very satisfying lunch, we set off to do some shopping. It took us all of 10 minutes to walk up and down the entire main strip of St. Michaels. We did find one pretty stellar item that HAD to be purchased. 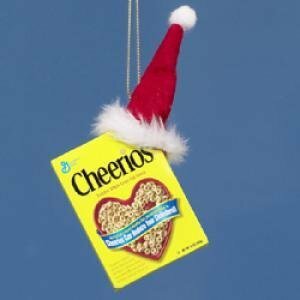 explanation: Chris eats Cheerios every single day without fail. When I say eats…I mean 3 big bowls every single morning. It’s impressive. So anyway…after this big buy..we contemplated what we should do with the rest of the afternoon before dinner. It had started to rain, there was no beach to dig our feet into and 1/2 of the shops were closed. 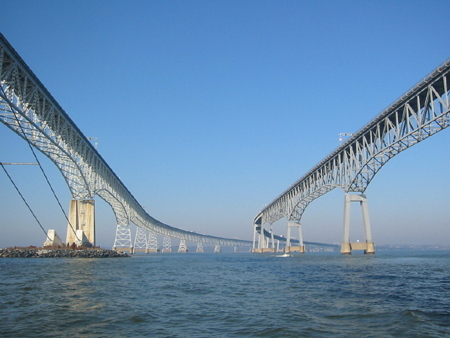 We hopped back in our speedy yellow vehicle and drove to Tilghman Island, which was just 12 miles down the road. We hoped hoped hoped that we would find activity, but nothing. Not even a place to buy an ice cream! So back we went in our speedy yellow rental car to St. Michaels. We figured we didn’t have anything to do so we should probably go find more food. 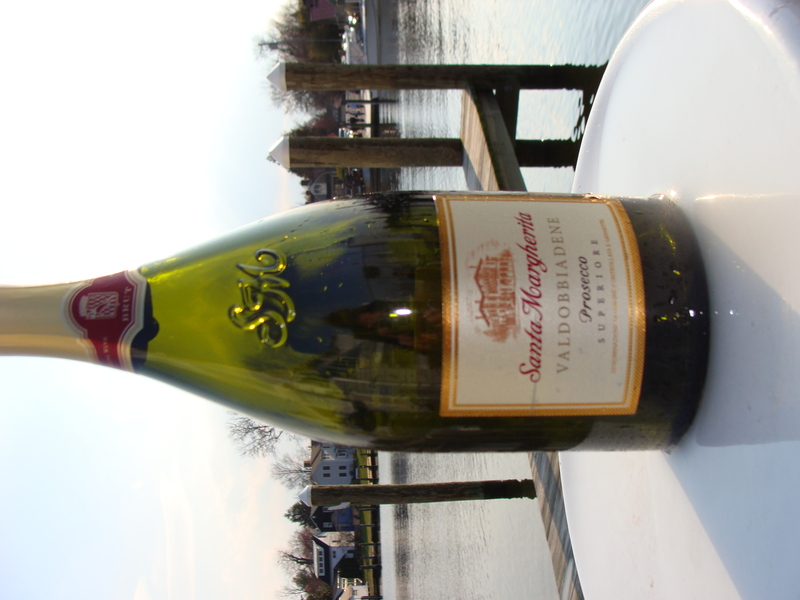 We stopped at a grocery store, picked up a bottle of Prosecco (because it is important to celebrate life), some cheese and crackers (and a cookie and yogurt because I claimed that this made the meal “more substantial) and made ourselves a little happy hour on a town dock. Happy hour lasted until it was time to get ready for dinner. 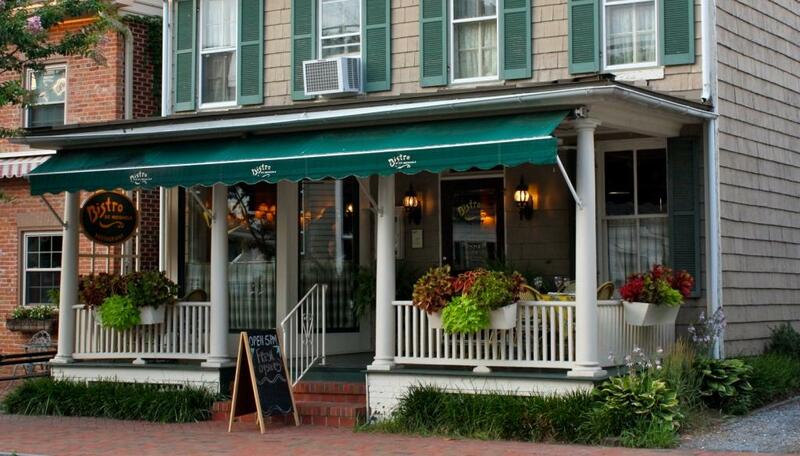 I had made a reservation at Bistro St. Michaels, as it came highly recommended. It did not fail. Not one bit. From start to finish…this meal was AMAZING. 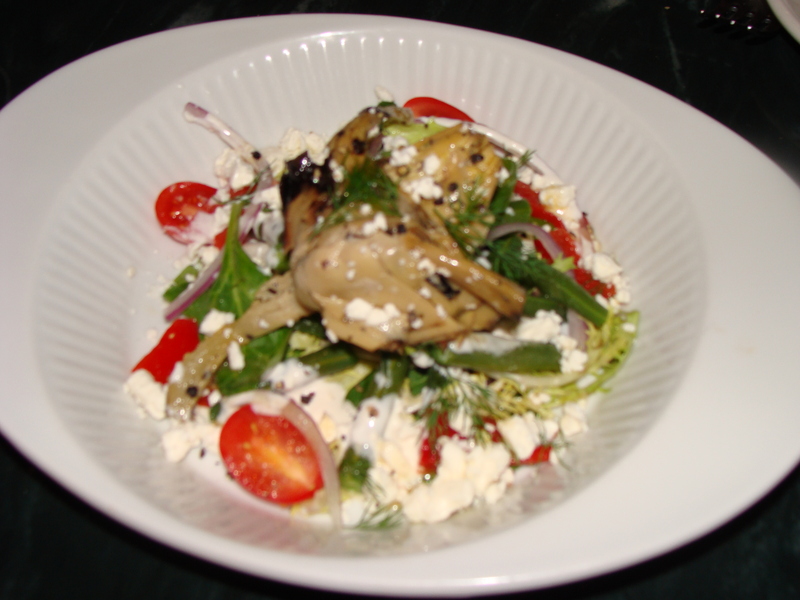 We started with Haricot Vert Salad tossed with roasted peppers, red onion, artichoke, frissee and feta dill vinaigrette. 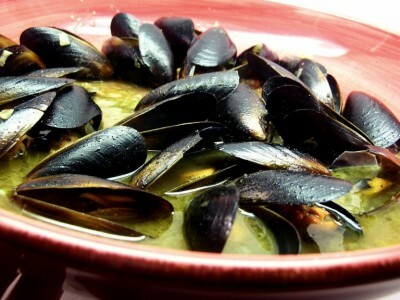 We then moved onto Mussels steamed in a spicy white wine and garlic butter broth (accompanied by some of the most delicious bread ever). 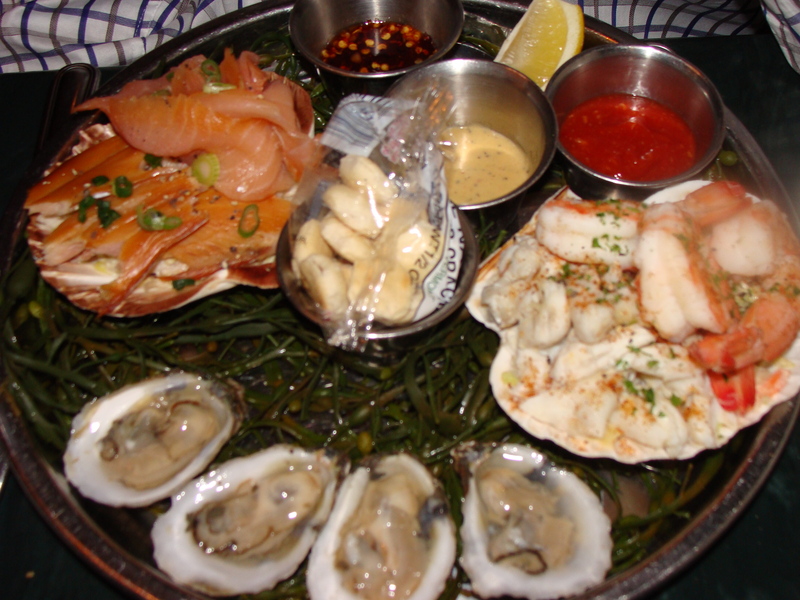 We then moved on to our main courses…Chris had a seafood plate, complete with oysters on the half shell, shrimp, crab and smoked salmon. 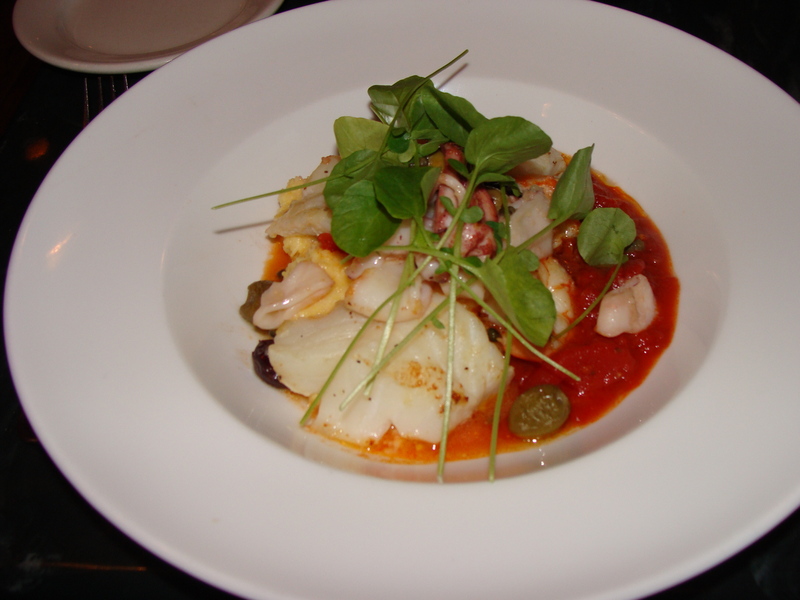 I went with Cod, Squid and Shrimp Puttanesca (a red tomato sauce) with creamy polenta and watercress. So good. So full. I couldn’t fit anymore food in my belly, but also could not imagine not taking advantage of the dessert menu. So we got it to go (and ate it about 20 minutes later). 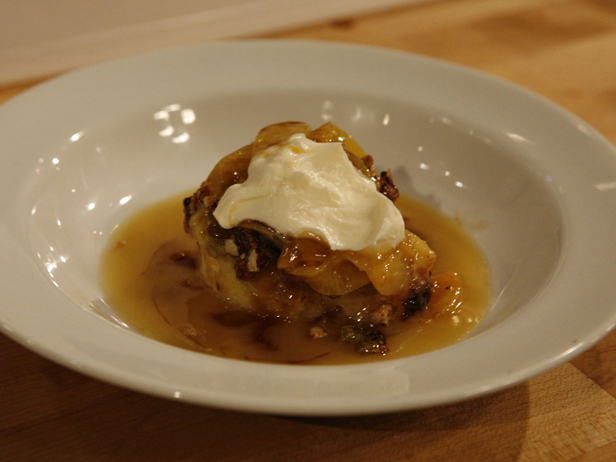 Introducing the best bread pudding ever. Apple Brioche Bread Pudding with caramel sauce. I admit…this is not the actual bread pudding we ate. It actually doesn’t even do our bread pudding justice. I dug into the take out container so fast and it was devoured so quickly that it was not until I was licking my fingers that I thought about taking a picture. My newest goal is to recreate a “healthier” version of this dish. It was SO good! Stay tuned for that! I fell asleep half in a food coma, half watching UConn beat Kentucky in the Final Four. We woke up the next morning knowing that other than more eating there wasn’t much to do, so we decided that a run would take care of our antsy legs and prepare us for our next eating activity…brunch. After a 5ish mile run in and out of the neighborhoods and sort of along the water, we drove our little yellow speed demon to the Inn at Perry Cabin. Not only is this place known as the hot spot of St. Michaels, but it is also where parts of Wedding Crashers was filmed! It was a must see. This place was fancy shmancy….and so was the food. But it was worth every penny! 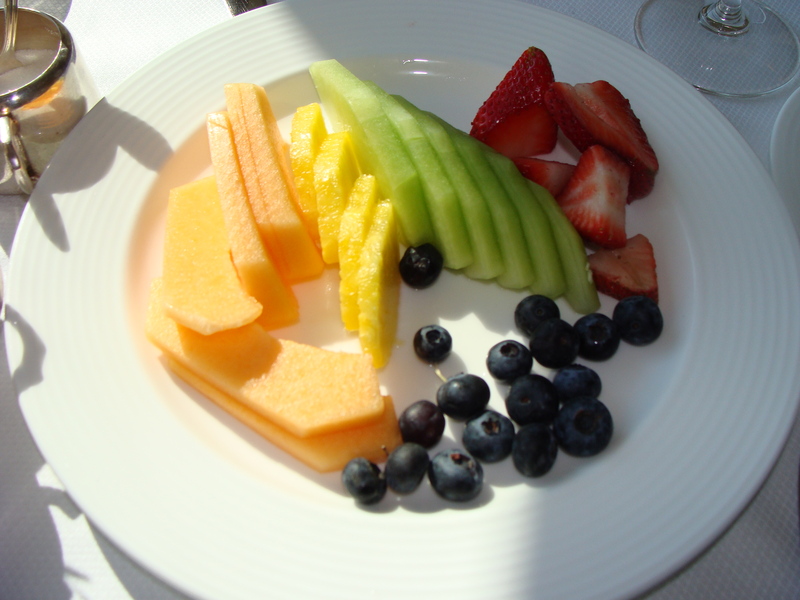 A $10 fruit plate to share…I really savored those blueberries! 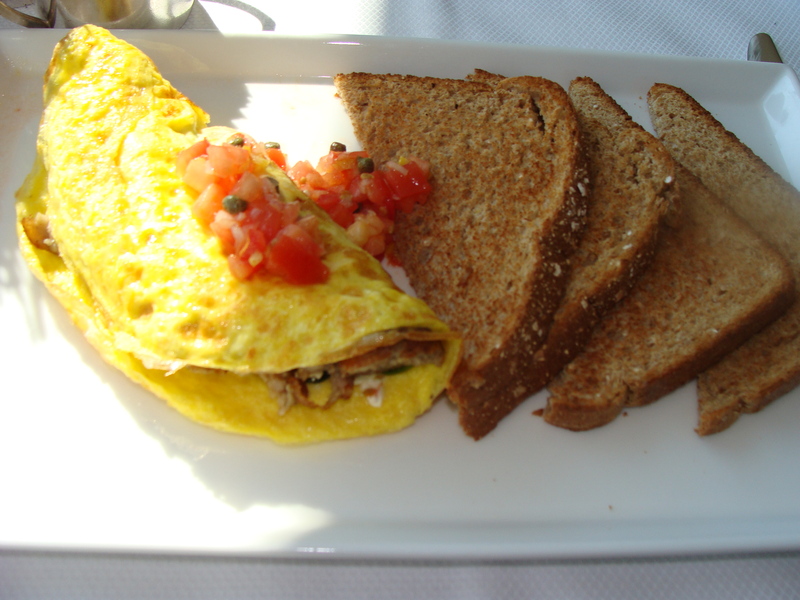 I had the Miles River Omelet: feta, tomatoes, sausage and spinach with a side of whole wheat toast. 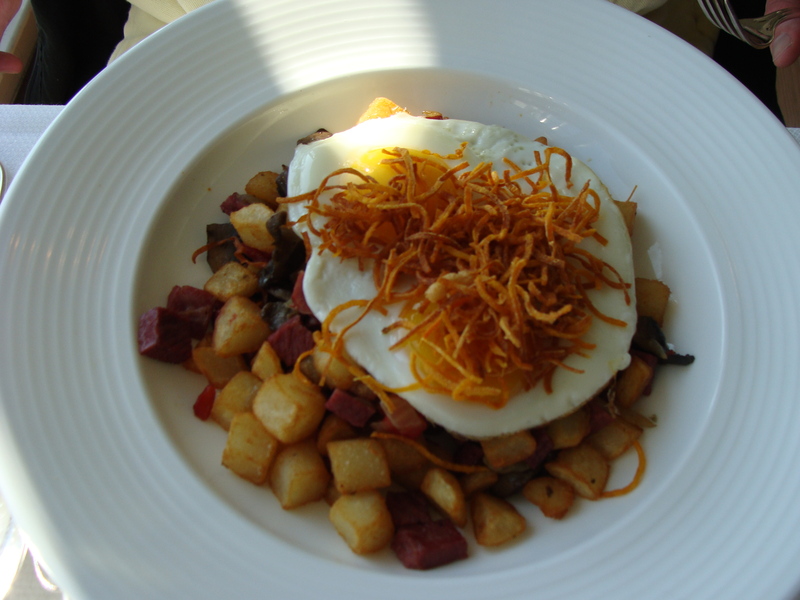 Chris had the Waterman’s Hash: corned beef, roasted peppers, onions, mushrooms, potatoes and fried eggs. We took a short stroll outside to help our brunch settle. It was a beautiful day. 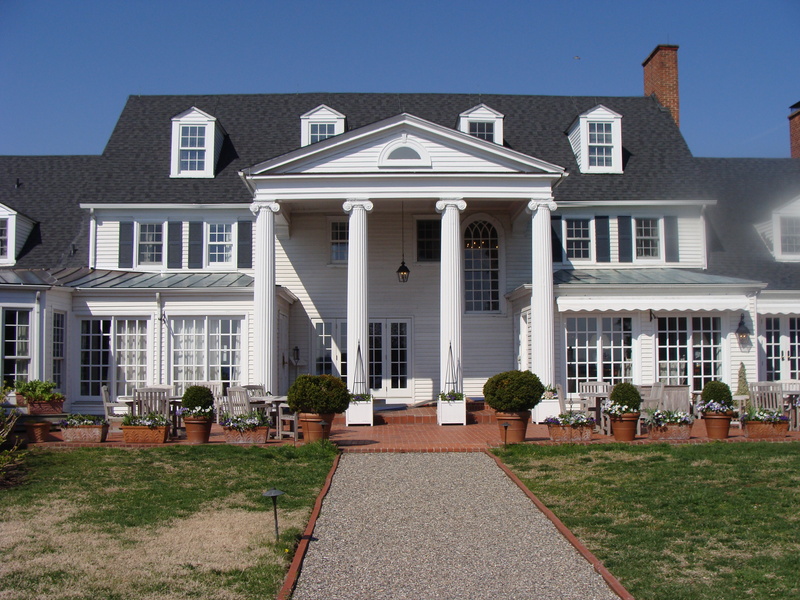 Wow….my husband and I just returned from a weekend getaway in St. Michael’s. It’s always so interesting to me what other people find boring. Our feet were worn out from so much walking and trying to see everything. We were anything but bored and can’t wait to go back. Boating, cute restaurants, shops, a microbrewery and rum distillery. We also partook in the half marathon going on the same weekend. Can’t wait to go back and agree with you about Perry Cabin…that place was great. We loved Gina’s and Ava’s for food. Had breakfast at the Bistro and it was also very nice.